KABUL, Afghanistan (CNN) -- International troops in Afghanistan endured another deadly attack Tuesday, a day after 10 NATO-led troops were killed in that country. 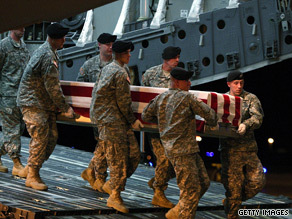 The body of a U.S. soldier killed in Afghanistan arrives in the United States on Monday. A U.S. coalition service member "died as a result of injuries" on Tuesday afternoon in a roadside bombing attack on a convoy in western Afghanistan, the U.S. military said. This follows 10 NATO-led deaths on Monday, the highest single-day total in Afghanistan in nearly a year, according to NATO and U.S.-led coalition numbers. Seven Americans, two Canadians and one Briton died in four separate incidents Monday. On August 18, 2008, 10 French soldiers were killed when about 100 insurgents attacked a patrol in Kabul Province, and a British soldier was killed in southern Afghanistan when insurgents attacked a patrol with a roadside bomb. A month before that, 10 American troops were killed in two separate incidents on July 13, 2008. The latest deaths came as U.S. troops cranked up their fight against the Taliban, a push that includes a major Marine-led offensive against the militants in the southern province of Helmand. Roadside bombs Monday killed four Americans in the northern province of Kunduz and two in southern Afghanistan, NATO's International Security Assistance Force said. A seventh American died in an insurgent attack in eastern Afghanistan, ISAF confirmed. Two Canadian air crew members and a British soldier were killed when a helicopter crashed during takeoff in Zabul province, the Canadian and British defense ministries said.